CATCHING Light is an installation of woven stars for the One Million Stars to End Violence project, created by local artist and weaver, Maryann Talia Pau. The goal is to weave one million stars for a major display at the Gold Coast 2018 Commonwealth Games. The exhibition aims to raise awareness of the monumental work that needs to be done to end all forms of violence, including violence against women, bullying and racism. In the lead up to the Gold Coast 2018 Commonwealth Games, Maryann has set a goal for the Redlands to become one of the largest Star Weave Communities and to help weave as many stars as possible by December 2016 for a display at Redland Performing Arts Centre in February 2017. 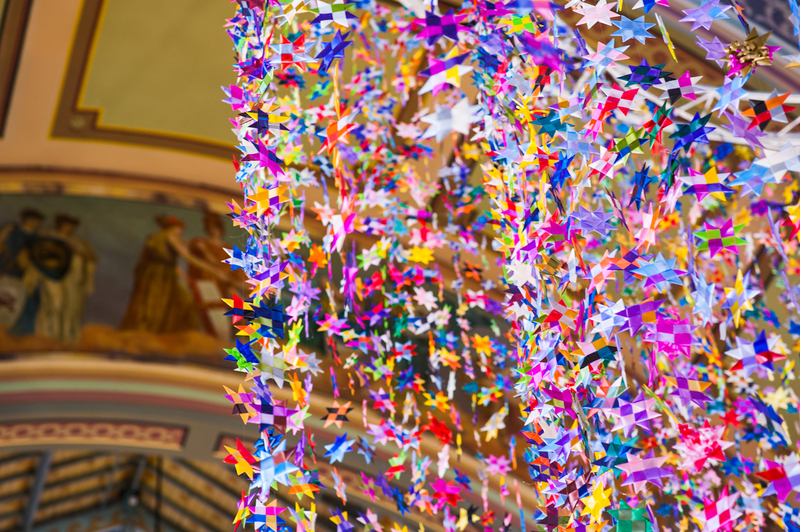 Show your support for the One Million Stars to End Violence project by dropping off your stars or weaving a star at Redland Art Gallery, Cleveland during the CATCHING Light installation. Image: One Million Stars to End Violence 2013, The Big Design Market, Royal Exhibition Building, Carlton. Image courtesy of John Englesos.